Many people associate the arrival of fall by the appearance of red, gold, and yellow leaves on trees or seeing groups of pumpkins suddenly pop up on people’s front porches. However for those of us who have native trees/shrubs, fall also means seeing the clusters of purple berries on our American Beautyberry. 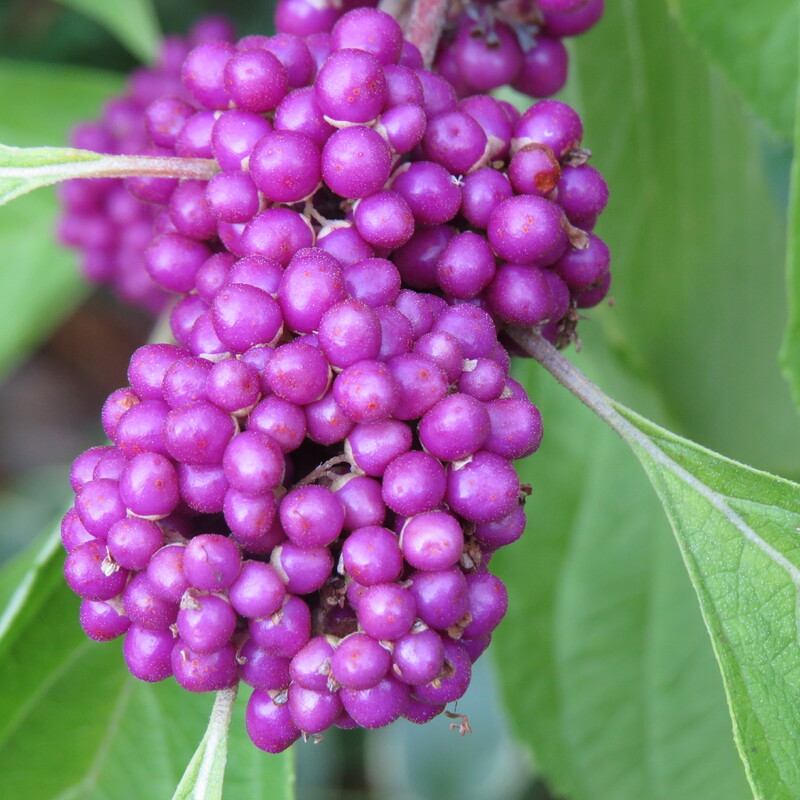 American Beautyberry grows best in partial sun and often used as an understory tree. Found growing wild in East Texas thickets, this deciduous, 4-6 foot shrub or small tree has small, unspectacular greenish-white flowers in the spring, but is known for its showy clusters of purple berries in the fall. It prefers moist soils but can be grown in the sun with supplemental watering; and it is tolerant of various soil types. Aggie-Horticulture suggests pruning its long, arching branches back by 1/2 in the winter if a more compact shrub is desired. Most Beautyberries have purple berry clusters; however there is a white-berried variety, C. americana var. lactea. 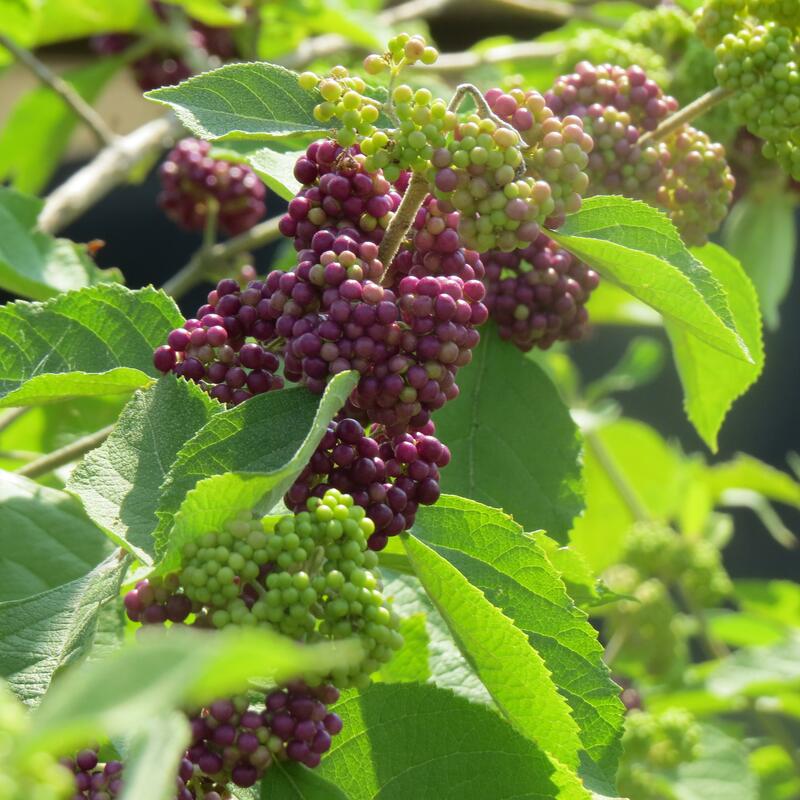 The Demonstration Garden grows a Mexican variety called Callicarpa acuminate ‘Texas Maroon” which has maroon berries. There is no controversy however that ripe Beautyberries are one of wildlife’s favorite foods. In my own yard, I only able to enjoy seeing the ripe purple berries for about a week before the mockingbirds have eaten every berry off of my large tree. Green Dean, who writes about foraging for wild edibles, reports that the Beautyberry is a squirrel’s version of take out. Other birds that enjoy eating the berries are robins, catbirds, cardinals, mockingbirds, brown thrashers, and finches. So, if you want a shrub/small tree that will provide fall color and feed the wildlife (and perhaps you too), think about planting an American Beautyberry. You won’t be disappointed. Posted in Fruit, Water Wise, Wildlife Habitat and tagged American Beautyberry, Beauty Berry, Fall Gardening in Dallas, WaterWise gardening, Wildlife Habitat. Bookmark the permalink. 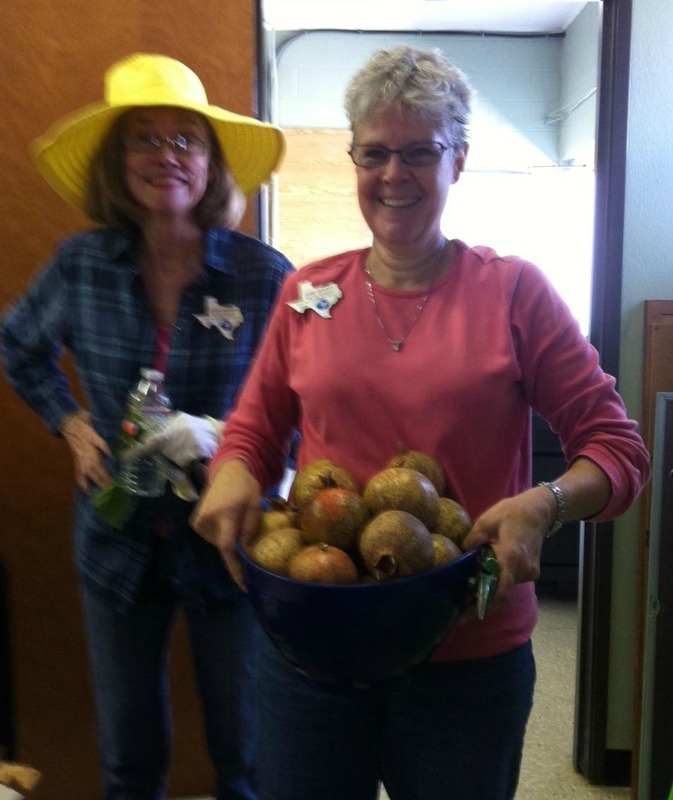 Our garden at 2311 Joe Field Road in Dallas, Texas has turned delicious! 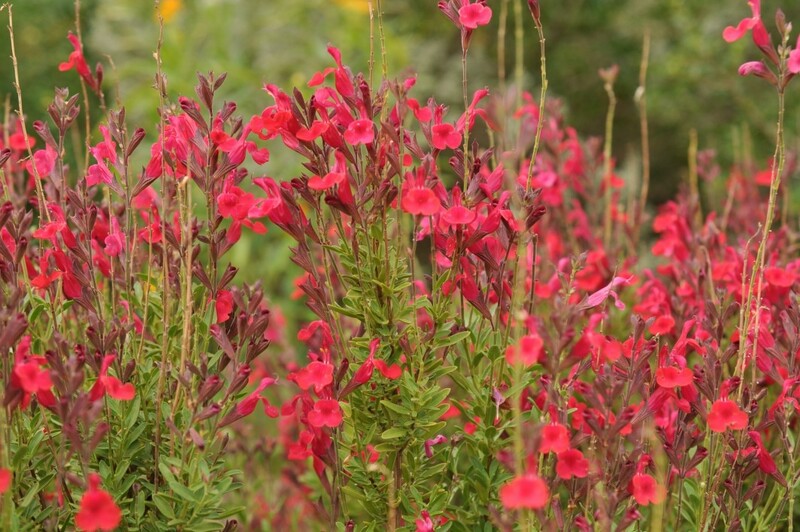 This is Salvia greggi ‘Raspberry’, a perennial you will want in your water wise garden! Hmmm…looks good enough to eat, but please don’t. Plenty of edibles from our garden are coming. 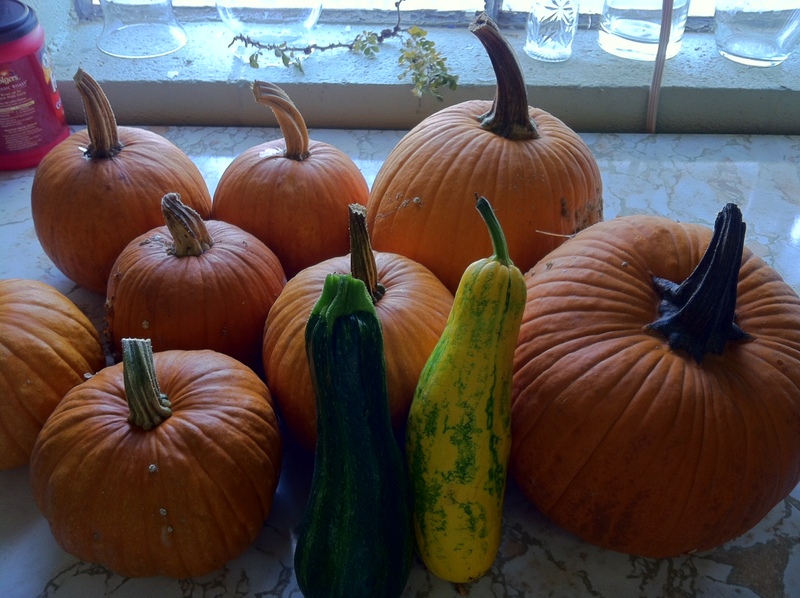 Jim made pumpkin pie for us after cooking up these pumpkins we grew! We have been picking pomegranates in our garden and are ready to make our famous pomegranate jelly again. Lisa picked pomegranates from a neighbor’s tree; after asking permission. Imagine they didn’t want the fruit! Should we share a jar of our pomegranate jelly with them? If you would like to buy a jar of pomegranate jelly made from Sarah’s recipe and these pomegranates, come to our Dallas County Master Gardener meeting on Thursday, October 24th at 11:30 am at the Farmer’s Branch Rec Center. All welcome! 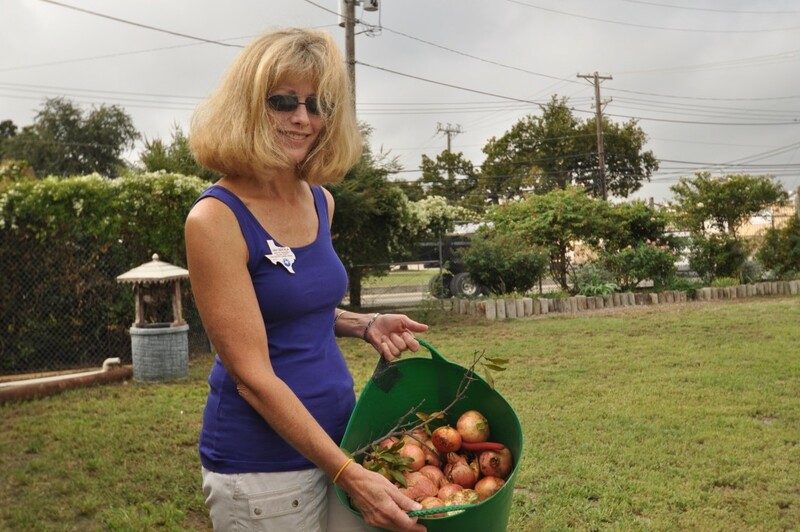 Posted in Fall, Fruit, Fruit Trees for Dallas, Water Wise and tagged Dallas County Master Gardener, Dallas Perennials, Pomegranate Jelly, Pomegranates, Salvia, water wise garden, WaterWise gardening. Bookmark the permalink. Up till now, I lumped blackberries in with blueberries. I have even picked black/blue berries in East Texas’ crushing heat and humidity. (Now I buy them at the farmers market.) I assumed that blackberries, like blueberries, had to have only acid, sandy soil. But listen up here: We can grow blackberries in Dallas! If you amend Dallas’ heavy, alkaline clay with expanded shale, cottonseed, and compost, and plant in raised beds, you will have enough berries for all the pies you can eat. 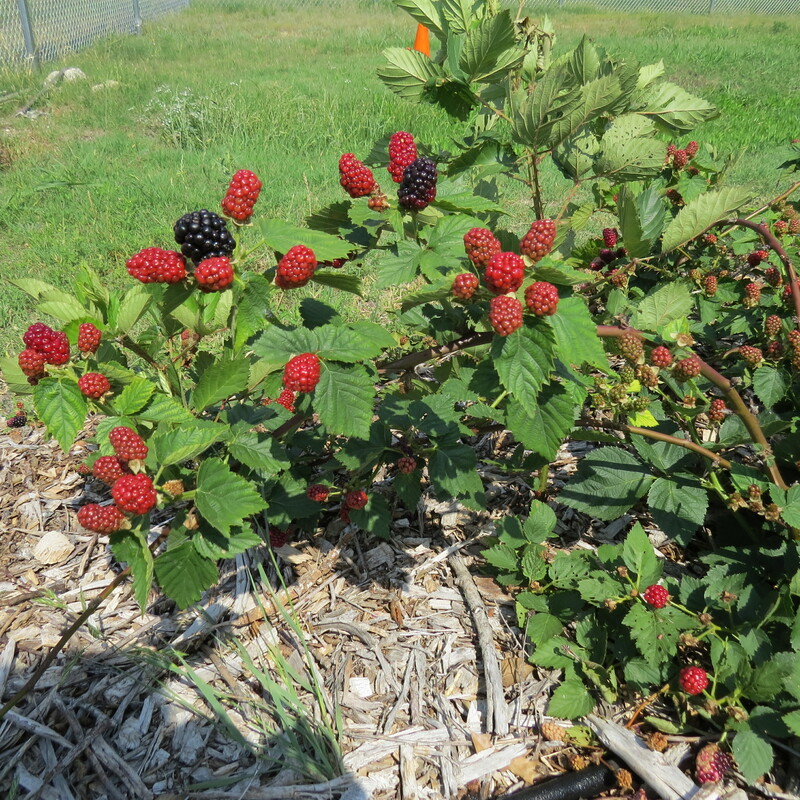 Blackberries like lots of moisture and full sun; run a drip irrigation line down your row of plants. If you look at a blackberry leaf, it doesn’t resemble the smooth oval leaf of a blueberry. Turns out blackberries and raspberries are not true berries; they belong to the Rosaceae family and are kissing cousins with roses. Maybe that explains those worrisome thorns. The “berry” is actually a collection of many drupelets; each holds a seed surrounded by the luscious berry flesh. Blackberries can’t decide whether they’re a perennial or a biennial. The roots aren’t going anywhere (perennial). But the top canes do a two-year production number before their curtain call (biennial). The first year, the new canes “primocanes” grow vigorously but don’t have any flowers. The second year the same canes, now called floricanes (flori=flowers), get busy housekeeping, have flowers and berries and retire. 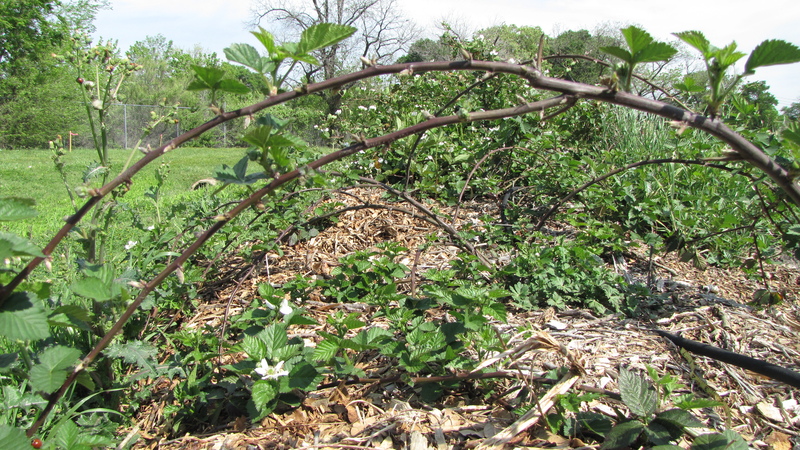 Tim says to cut back all the blackberry canes that have produced in July –August, leaving the primocanes for next year’s crop. ‘Brazos’ was developed at Texas A&M and introduced in 1959. Most of the thorned varieties have Brazos in their heritage. 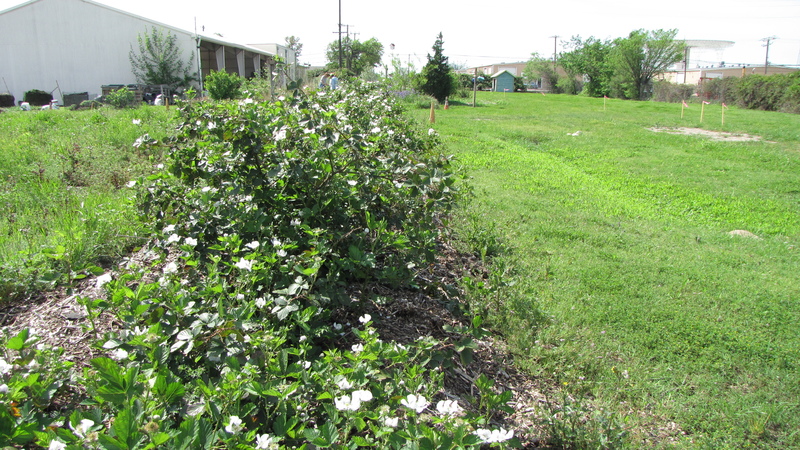 The Texas standard for years, Brazos is a large, erect growing, high yielding blackberry. ‘Rosborough’ was released by Texas A&M in 1977. It ripens just after ‘Brazos,’ and has firmer, sweeter berries and smaller seed. 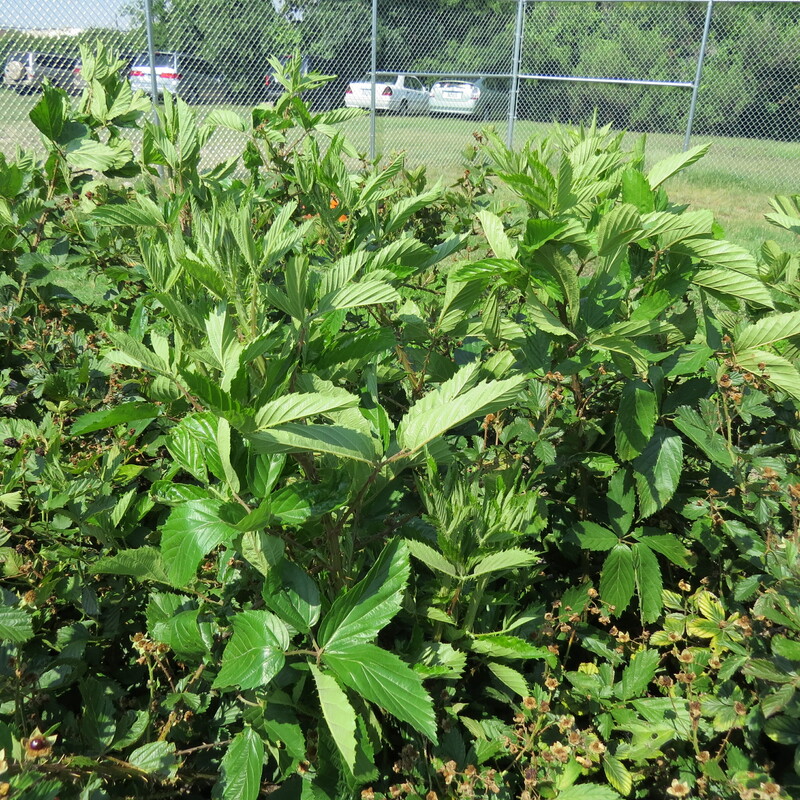 ‘Rosborough’ is a large plant, disease resistant, and very popular throughout Texas. ‘Womack’ is the smallest of the TAMU releases, with fruit that is firmer and better quality than ‘Brazos.’ Also released in 1977, it performs best in Central and North Texas. It is not recommended for southeast or northwest Texas. Tim planted one thornless variety, ‘Natchez,’ which in our small trial produced more than the thorned plants. Released in 2007 from the University of Arkansas, ‘Natchez’ has firm sweet fruit and upright growth. It ripens early and has good disease tolerance. Plant blackberries in the fall. 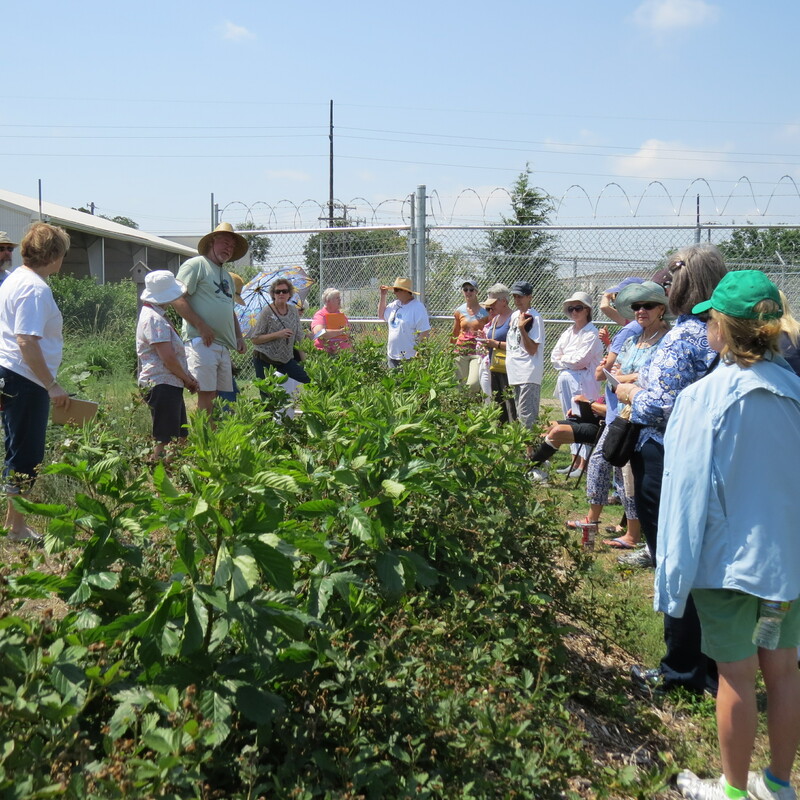 Tim suggests purchasing plants from Womack Nursery in De Leon, Texas. Right now, I’m scouting the yard for a sunny spot to fill with blackberries this fall. Buy local blackberries at farmer’s markets and use our recipes being posted yesterday and over the next few days to satisfy your cravings. Next year maybe you will have your own producing patch! Posted in Fruit and tagged Blackberries, Dallas Orchard Planting. Bookmark the permalink.